Troop 29 has been serving the youth of the Red Clay Creek and Pike Creek Valleys since 1953. Sponsored by Red Clay Creek Presbyterian Church, we offer a fantastic Scouting program to boys aged 11 to 18. Our purpose is to develop men of solid moral character; informed and active citizens who are physically fit. Troop 29 meets every Monday from 7pm to 8:30pm year round. Additionally, we provide a camping weekend every month for our scouts, and try to have at least one High-Adventure activity per year for the older scouts. Interested in our Troop? Then please feel free to stop by at any Monday Troop meeting, or contact us using the link below OR by phoning the Scoutmaster at the phone number above. The best thing about Scouting is that you can be involved right along with your son! Family involvement is very important to Scouting because family is important. The volunteers who run a Boy Scout troop can be mentors to your son, but they can't replace you. Scouting is a fun activity that manages to combine fun, the outdoors, and learning into one great adventure. 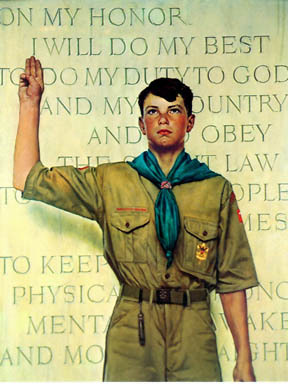 The Ideals of Scouting are described in the Scout Oath and Scout Law. These are the main building blocks of Scouting, and they describe our goal for each boy who joins. Without the Scout Oath and Law, Scouting would be just another fancy club. The Patrol is the basic unit of Scouting. When your son joins Scouting, he becomes a member of a patrol. That's the group of Scouts he'll be living with when he goes camping; the group he'll play with when he goes to meetings and other activities; the group he'll work with when there's work to be done. His patrol will be a lot like his family because his patrol mates will support him when he needs help, comfort him when he's scared, laugh with him when he's happy, and be right there with him when he gets muddy. The Outdoors is where Scouting happens. Sure, some things are done in a building. They can even be done in front of a computer, but the most important things happen outdoors. Let's face it, Scouting wouldn't be any fun if you didn't get to go outside. In Scouting, your son will get to be outside a lot! He'll learn to be comfortable sleeping in a tent in the winter. He'll learn to swim, hike, camp, cook his own food, follow a wild animal, and lots of other things. Scouting happens outdoors because that's where God intended boys to be! Advancement is how Scouts learn things. Not only will your son learn skills like camping and first aid, but he'll have the chance to try out lots of hobbies and careers like dentistry, electronics, journalism, fishing, coin collecting, and pet care. Each badge will present your son with several requirements that are challenging. They make him think about the world around him, plan tasks, and motivate himself to accomplish them. Advancement in Scouting isn't like School. It's self-directed, fun, and helps your son to develop the confidence to do just about anything he puts his mind to. Personal Growth is not just an outcome of Scouting. Scouting helps your son learn about his strengths and weaknesses. It gives him a chance to try different things in a place where failure isn't punished. He may start out learning about himself without knowing it, but it won't be long before he really starts to look inward and see who he is. It's not just the end result of Scouting - it's an important method of Scouting as well. You might think that Adult Association isn't that important to your son, but it is. Everywhere kids go, they are looking for adult approval. Sadly, they rarely get it except at home. Scouting gives your son a chance to get to know adults and learn to work with them. He'll get a chance to see how adults act, and that will give him some good examples to go by when he becomes an adult. Scouting also gives you a chance to be directly involved in an activity with your son. Parents aren't just spectators in Scouting, they're the Scoutmasters, committee members, and merit badge counselors that make Scouting possible. One of the most exciting things about Scouting is Leadership Development. Unlike other youth organizations, Scouting isn't adult oriented. Adults are there to be guides and mentors. It's the youth who make the decisions, develop the program, and make Scouting work. In Scouting, your son will get a real chance to make decisions, learn to compromise, and actually lead other Scouts. He won't simply be doing what the adults tell him to do, he'll be deciding what to do and how to do it. Your son's Uniform in Scouting is a lot more than just clothing. It's an outward symbol of the commitment he makes to the ideals of Scouting. It's also a place to show off his accomplishments. It gives him a feeling of belonging to a group with similar values. It gives him a reason to take pride in the way he looks, and in the badges and awards that testify to his achievements. To the community he lives in, his uniform represents a welcome image, a reminder that not all kids are bad, and not all gangs are violent. I hope that you'll seriously consider joining us in the Boy Scouts of America. Please contact us if you are looking for a great scout troop. Register to receive email communiations about Troop 29 by using the box below. Please allow time for account verification and approval. Troop 29 has been serving the youth of the Red Clay Creek and Pike Creek Valleys for over 55 continuous years. Based at the Red Clay Creek Presbyterian Church, we offer a fantastic Scouting program to boys aged 11 to 18. Our focus is to develop Leadership, Citizenship and Outdoorsmanship in each and every scout that is a member of our Troop. Troop 29 meets every Monday from 7pm to 8:30pm during the school year and off-and-on during the summer. Additionally, we strive to provide a camping weekend every month for our scouts, and try to have at least one High-Adventure activity per year for the older scouts.